The last few years have given us astonishing new ways to see movies. First videotapes, then DVDs, portable players, Netflix, streaming movies, movies-on-demand, iPads, iPhones, and their offspring--I love them all. But they haven't taken us to new ways of seeing movies. They've taken us all the way back to the way we first saw movies, the Edison way. In reality, they are taking away from us the special, wonderful experience of movies. 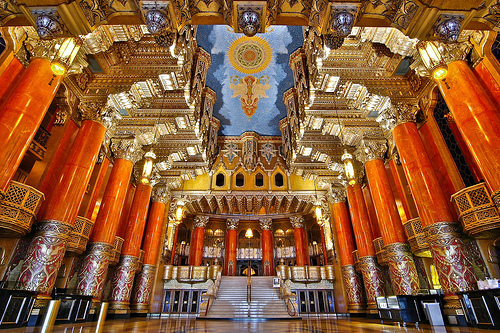 Gone are the great movie palaces of the past with their decor like baroque palaces or Egyptian temples. The old theaters had hundreds of seats. You were part of a big, big audience. You weren't sitting with just a couple of dozen people in a multiplex auditorium. 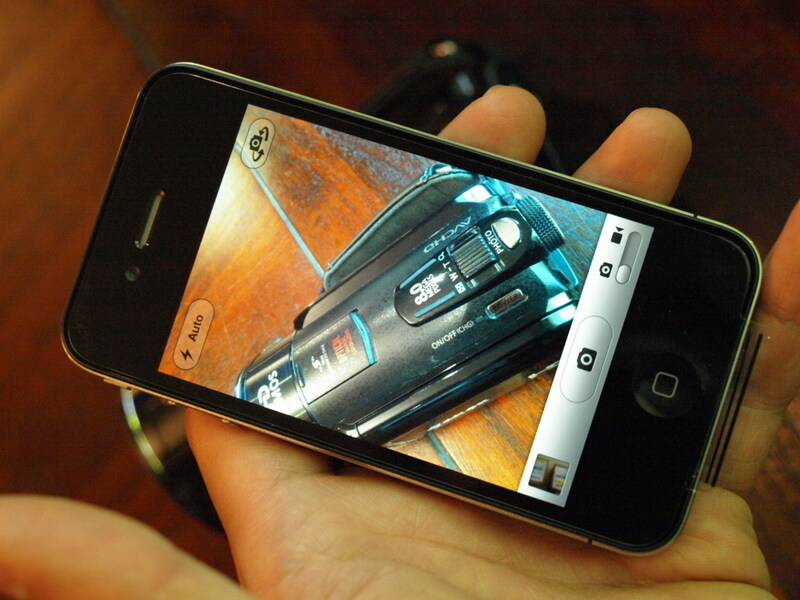 You were certainly not the solitary viewer of a DVD on your tv or a movie streamed to your iPhone. 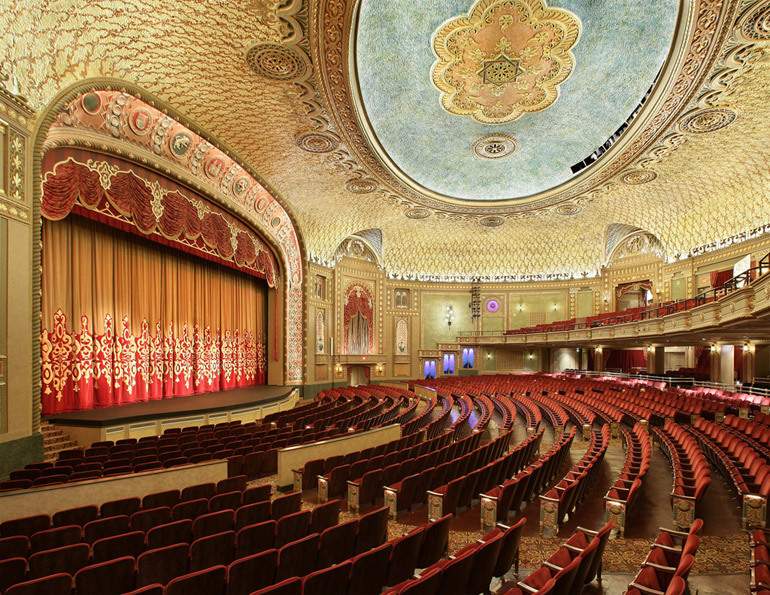 Gone are the days when your only way to see a movie was to go to the local Bijou. If you were a real movie nut, you could get hold of a 16 mm. print and show it in your basement. The rest of us had to enter a special, ritual place, the theater, and it made a big difference. Two differences, to be precise. First, let me assure you, as a psychological critic, that being part of an audience, the bigger the better, forms an important part of the movie experience. Psychologically, in a theater you become part of a mob. That is, you turn over part of your mental functioning--your defenses--to that collective mentality. If the rest of the audience laughs, you feel licensed to laugh. If they cry, you will feel free to cry. If they are restless and noisy, you will share their retreat from the movie. If they hiss and boo, you feel free to join the chorus. You don't decide what's okay to do in the theater; they decide for you. Second, you lose control another way. The theater and the projectionist control the viewing. You don't. The theater creates a dark space where you see nothing but the screen. You have to sit still. If you are enjoying the movie, you focus entirely on the screen. The film controls, not you. You can't stop it, start it, or pick another film. You can't get up and wander around. The film rules. You have to give yourself to it or leave. That is the important reason nothing substitutes for the theatrical experience. Sitting still, giving up your wish to act, does special things in your brain. You know cognitively in your prefrontal cortex that you are not going to act to change what you are seeing. That's different from everyday life. If you are out on the street, you know that you may have to act to dodge that truck or stop for a red light or any one of a hundred things. But in a movie theater, you know you aren't going to do anything but watch the movie. Your cognitive systems shut your motor systems down. I have written at length about this shutting down of motor systems in Literature and the Brain. But the New Yorker critic Anthony Lane put it concisely when he was talking about improbabilities in movies. "Watch [them] on DVD and you find yourself scoffing at the unlikely curves and switches in the plot, whereas the same setups, viewed in the dreamy imprisonment of a movie theatre, feel like the machinery of fate." "Dreamy imprisonment" gets it exactly right. We know we can't do a thing to affect what's going on the screen. We don't need to test the reality or probability of what we are watching and we don't. In Coleridge's old phrase, we suspend our disbelief. Also, lower, subcortical parts of our brain, the parts that give rise to emotions, get freed up. They are less defended against. Emotions carry with them impulses to act. In real life, we have to control those impulses. In a movie theater, we don't. Our defenses don't have to come into play to guard against wrong actions. We can have emotions undefendedly. We can feel pleasure, joy, grief, anger, lust, fear, all of our emotions, more strongly than in daily life. But nowadays you can show a movie on your television at home. The convenience and the comfort are quite wonderful. But this easy experience is quite different from seeing a movie in a theater. You are the one in control. You can stop the film to get a beer or to go to the bathroom. You are in your own home, not a special place designed for an artistic experience. The lights are probably on, at least dimly. You see all the paraphernalia of your daily life, its pleasures (snacks), its worries (that stack of unpaid bills), and its rituals (time to walk the dog). 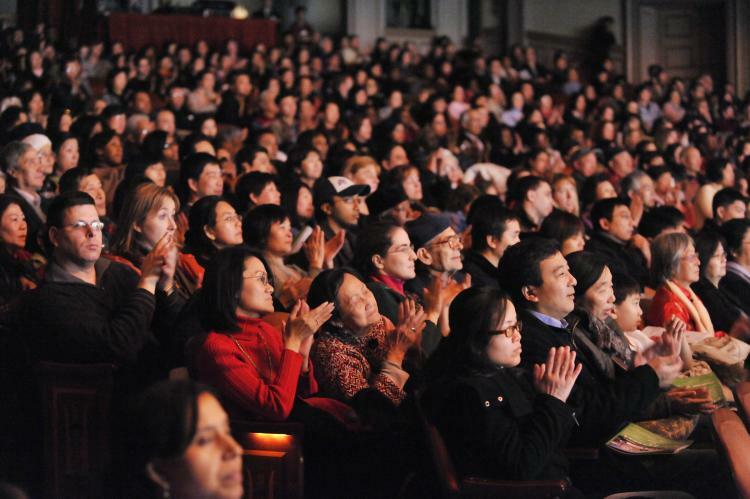 There may be other people in the room, but they are not the engrossed strangers of a theater audience. They are people you see every day and relate to when you should be focused entirely on the screen in an otherwise dark movie theater. Often, alas, such a home audience feels free to comment or to wisecrack. The audience, not the movie, becomes the focus of attention. This way of seeing a movie doesn't let you really get "into" the film, focused entirely on it. Nevertheless, it is probably the way you will see most of the movies discussed on this site. These are classics--or at least old--and you are unlikely to find them in theaters unless you are lucky enough to have a film classics series where you live. You will be doing Netflix or video-on-demand in your own home. VHSs and DVDs at home were just the beginning. Now, we've gotten even more new and interesting ways to see a movie. You can play it on a laptop computer or a personal DVD player, an iPhone or an iPad or any of their kindred. You can use headphones, blocking out the sounds around you. Curiously, that was the way Edison created for seeing films when movies were first being invented. You were to look, one viewer at a time, into his Kinetoscope, like one of those viewers you still see at amusement parks where you peer through a peephole eyepiece as photographs that flip past, creating the illusion of motion. Now, as you could then, you can plug yourself into the movie, as it were. You are in control as in the home experience. 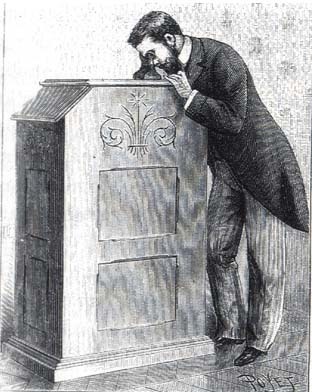 As with Edison's Kinetoscope you don't get the release that other members of the audience give you. You can't share their mentality. In short, all the wonderful technology has just taken us back to where we began--so far as the movie experience goes. Then there are the awful ways to see a movie. Lawrence of Arabia on the three-inch screen of a cell phone! 2001 held in your lap on an iPad! What a grotesque shrinking of the thirty-foot glory of a film image! Or movies on airplanes with their interruptions, passenger noise, crazy color balance, and teensy screens. Ugh. But these ways of seeing movies have the undeniable advantage of making it possible to see a movie pretty much wherever you are. As for the movies I talk about on this site, you are probably going to see them on your television at home via DVD or videotape. Those media do have one great advantage: you can study a film, going back and forth over particular sections. If you're not doing that, do try to make the experience as much like the theatrical experience as you can. Gather friends and neighbors and tell them to be quiet! Keep the lights low, and don't interrupt the film. Movies are wonderful works of art, probably the greatest way we humans have found to tell a story since the invention of language itself. To enjoy the art of the movies to its utmost, give yourself over to them. Immerse yourself. Lose yourself in the work of art.